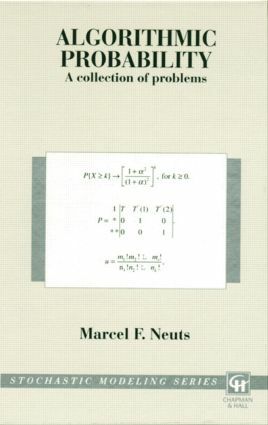 This unique text collects more than 400 problems in combinatorics, derived distributions, discrete and continuous Markov chains, and models requiring a computer experimental approach. The first book to deal with simplified versions of models encountered in the contemporary statistical or engineering literature, Algorithmic Probability emphasizes correct interpretation of numerical results and visualization of the dynamics of stochastic processes. A significant contribution to the field of applied probability, Algorithmic Probability is ideal both as a secondary text in probability courses and as a reference. Engineers and operations analysts seeking solutions to practical problems will find it a valuable resource, as will advanced undergraduate and graduate students in mathematics, statistics, operations research, industrial and electrical engineering, and computer science.